There is single most important piece of the New World Order agenda has ALWAYS been to make sure that Western societies produces no real heroes. That policy decision by the ruling elites was solidified with the assassinations of JFK, MLK, RFK, Malcolm X, as well as many other modern-day heroes, some of whose names never even made into prime time. Well, Nigel Farage is a very real hero of the 3rd millennium. Their ascendancy on the world stage proves without a shadow of a doubt, that the NWO cabal is losing power in a serious way. Simply put, these two indomitable Brits shouldn’t be there, particularly in view of the pivotal NWO goal of establishing a One World Government. In spite of the many conspiracy theories that are now flying around cyberspace about a BREXIT psyop, Nigel Farage has entered the room. He is the real deal, as you cannot fake his awesome act. Nor did the NWO crowd use him to accomplish some cynical objective. In other words a true hero has emerged, and done so at a most critical point in the implementation of the NWO agenda. FYI it really makes no difference how BREXIT proceeds, or does not, at this point. An authentic ‘six sigma’ Black Swan* event has taken the whole world by storm, and it has catalyzed an inevitable process of global revolution. The 1% has never been surrounded by so many real existential threats. And they know it. 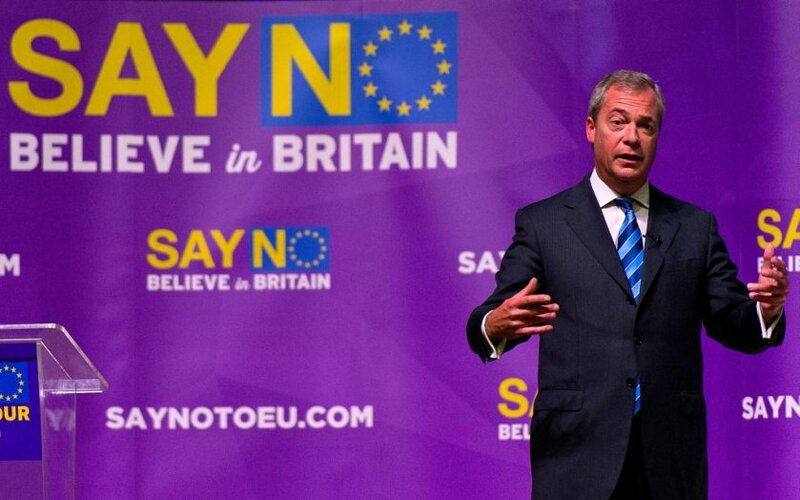 UKIP stands for the United Kingdom Independence Party and one of its founders and current leader is Nigel Farage. The only way to properly understand the BREXIT phenomenon is to understand the people in Great Britain who started it and who fought very hard for it. That would be one Nigel Farage. 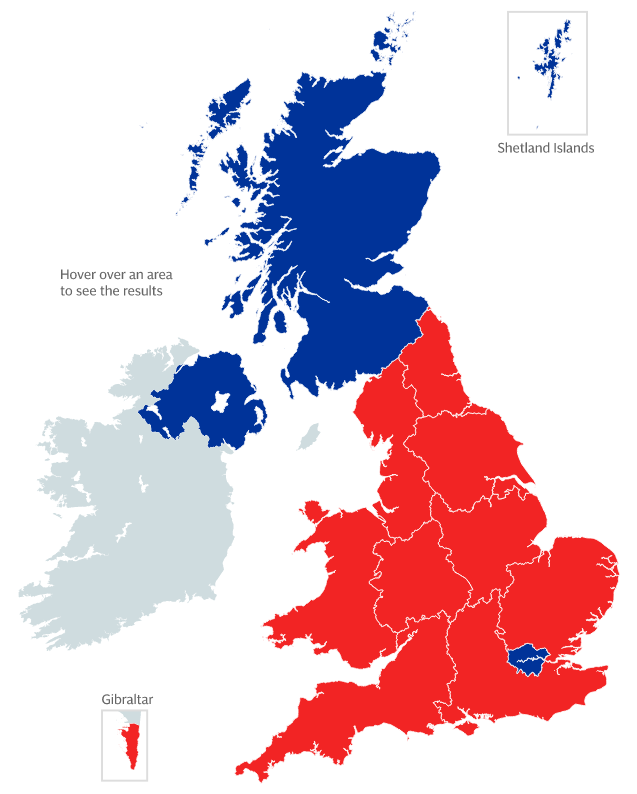 The following map depicts the fruit of his herculean effort where all of England minus London voted to leave the European Union. He is already being compared to the key Founding Father of a reborn United Kingdom, a nation which was subsumed by European Union oppression and tyranny since its joining. The only way to understand this grassroots movement is to understand the intentions of those who guided it through years of challenges and obstacles. The following video offers a glimpse into the heart and soul of the British independence movement. It is an interview marked by candor and honesty and intelligence the likes of which will rarely be seen on American television. There is simply no way to accurately portray the real Nigel Farage. The man is a political dynamo and community organizer powerhouse, financial expert and economic guru all wrapped up in one. He was, and is, exactly what the U.K. direly needs at this delicate very moment of their history. Not only is he a man of incredible action and deep thinking, he is unlike the vast majority of politicians in that he really has a heart—a BIG heart. And it was his empathy for the British common folk, as well as the European commoners, which compelled him on his path toward the liberation of Great Britain from the European Union (EU). Farage knew from the get-go that the EU was conceived to be a quasi-communist totalitarian superstate designed to crush nationalism throughout the European continent. Although the EU started out as an apparently sensible economic union post-World War II, it quickly morphed into a political alliance with the imposition of the Treaty of Lisbon. This extraordinary usurpation national sovereignty occurred without the people’s consent anywhere within the Eurozone. The NWO ruling cabal just foisted it upon those European nations that fell prey to their machinations. Nigel Farage knew exactly what was going on in the background which is why he has been so vociferous in his attempts to wake up the people. Hence, what is most amazing in this modern yet classic saga of David versus Goliath is that TPTB permitted him to accomplish his goal. Of course, while the BREXIT referendum has voted in favor of leaving the EU, the hard process has yet to begin. That can only begin in earnest with the triggering of article 50 of the Lisbon Treaty. The following photo captures the absolute glee and sheer delight that Nigel Farage is experiencing this very day. He still can scarcely believe this happened; none of us can believe it has actually happened. Truly a ‘six sigma’ Black Swan event has overwhelmed the entire planetary civilization, and Nigel made it happen. In all likelihood there will be multiple initiatives to scuttle the result of this referendum. Already, the BREMAIN side has floated one obstacle after another as to why the vote should not be honored. Each one of their spurious arguments wreaks of NWO manipulation and determination to reverse the outcome. Nigel Farage is very wise to the antics and intrigues of TPTB. That he has lasted this long in the game of playing for British independence is remarkable by any standard, and surely a sign that the tables are slowly being turned on the ruling elites of the Crown Temple in the Financial District in the City of London. The key insurance policy, however, to an efficient and orderly BREXIT is the future follow through on Grexit and Nexit and Frexit, etc. Farage knows in his bones that the best way to ensure closure for BREXIT is to take down the entire EU, nation by nation, state by state. There is even a re-awakened movement across the pond in the form of TEXIT which might assist in this global movement. Other American states will undoubtedly follow suit to gain their independence from an equally tyrannical U.S. Federal Government. Were both the EU and US to be dissolved, Nigel Farage will then be able to rest comfortably. For as long as the USA is throwing its weight around the world, Great Britain is always liable to being drawn into war after war, conflict after conflict, whether it’s in or out of the EU. If ever there was a truly outstanding example of where just one person can make a HUGE difference, Nigel Farage’s BREXIT victory is it. His is a glowing illustration of raw courage and intestinal fortitude and true grit. So exemplary is Nigel’s commandeered win for the British people, that it will surely serve as a stellar example of what independence movements the world over can accomplish for their respective nations and societies. The real takeaway from watching the BREXIT saga unfold to victory is for each of us to realize the spirit of Nigel Farage that exists in each of us. Just imagine that if one man can achieve what he did, what a million of us can achieve working closely together. The world sits on the cusp of a profound and fundamental transformation the likes of which has never occurred. It will be the people power galvanized across the planet that will ensure such a necessary planetary change takes place, post haste! At the end of the day, the Nigel Farage story is everyone’s story. Each of us is being called to take back our power, stand in our own truth, and speak truth to power as never before. The time is now, the place is here, the ones to do this job are We the People.